I think it was either Phog Allen or Ra’s al Ghul who said, “Every time a civilization reaches the pinnacle of its decadence, we return to restore the balance.” I can’t tell if Indiana Pacers forward Danny Granger’s home renovation plans signal the pinnacle of decadence or not, but I am all for it. 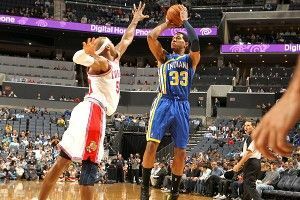 Granger, who is averaging 18 points per game for the surprising Pacers, is in the process of living out the American (teenage) dream. He is building himself a Batcave. Now, here is the part where you say, “Why so serious? !” and give yourself a high-five, right? No, he’s REALLY serious. Granger has been talking about this project for about four years now, dropping tidbits in various interviews. The construction of the superhero rec room is taking place in New Mexico. As you can imagine, Granger has had some ups and downs. “[T]he builder called me and told me he found a nice little feature, a lift for my car, kind of like Batman had. It’s in the works, it’s a process. [The superhero stuff] is just a big thing I’ve been a part of. Yeah, Danny. A moat. THAT’S INTERESTING. Now if you’ll excuse me, I’m going to go request a copy of Danny Granger’s contract, because I’m pretty sure, hidden deep within its pages, not unlike a contractual batcave, there is a clause that states: IF (PLAYER) MAINTAINS A SCORING AVERAGE ABOVE 15 PPG AND FINDS HIMSELF IN GOOD STANDING WITHIN COMMUNITY, (ORGANIZATION) WILL FUND HIS SECRET CRIME-FIGHTING ALTER EGO AND PARTIALLY FACILITATE CONSTRUCTION OF MOAT IN OR AROUND SAID CRIME-FIGHTING SMALL FORWARD’S SECRET LAIR. SIGNED, LARRY “ALFRED” BIRD.